UFO SIGHTINGS DAILY: Totem Pole Found On Mars, Has Face, Eyes, mouth, Teeth, and much more, UFO Sighting News. 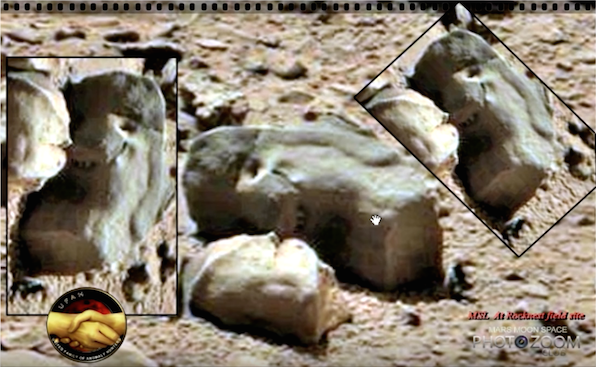 Totem Pole Found On Mars, Has Face, Eyes, mouth, Teeth, and much more, UFO Sighting News. This really detailed statue or totem was discovered by MMSPZC of Youtube. They have found some great evidence that a society once lived here that was advanced enough to build large stone structures and car faces and other wings into them. This one seems to an exceptionally long ear, which could actually be an arm. Its very easy to make out the hair, ear, eye, mouth, nose and even some sharp teeth. The other blocks near it look like part of the lower section of the totem pole or statue. This is another piece of evidence on the mountain evidence the UFO researchers around the globe have already created. It won't be long now before NASA just gives up and admits the truth.